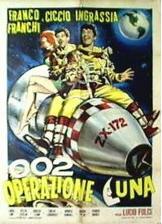 Popular Italian comedians Franco Franchi and Ciccio Ingrassia star as a pair of bumbling Russian cosmonauts aboard the spaceship Popov. After their ship loses contact with the base, the Soviet space program officials are loathe to face the international humiliation of losing two astronauts. So then they send up a second spaceship, a twin of the first. After locating a pair of Italian thieves (also played by Franchi and Ingrassia), who are dead ringers for the lost cosmonauts, the Russians kidnap them and send them up in the duplicate rocketship. Upon their return the thieves are welcomed as the real thing by their wives and families, but complications ensue as the original spaceship returns with the real cosmonauts. (In Italian language).